For yourself or for someone you love, this is the perfect gift for any true admirer of African Violets! The aim of the Violet-Of-The-Month Club is to provide members with many different varieties of premium Optimara African Violets. Though members do not have the option of selecting or rejecting specific cultivars, the program has been designed to ensure that each member receives a collection of many unique and beautiful varieties. 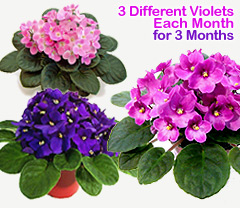 As a member of the Violet-Of-The-Month Club, you will receive three African Violets each month. These are genuine Rhapsodie and Optimara Violets, every one guaranteed to be beautiful and high quality. Collect all the varieties, even the hard-to-find ones. And as a Violet-Of-The-Month Club member, you will also be among the first to receive the newest cultivars! 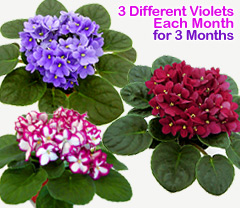 You join the Violet-Of-The-Month Club for 3 months at a time and are billed one time, shipping included. Select East Zone or West Zone depending on your Time Zone. We keep a record of your shipments, but all members get the same 3 varieties every month. In order to avoid duplicates, renew for another 3 months without a gap if you wish to continue. Members who sign up for a total of 12 months will receive 3 EXTRA PLANTS with their last shipment! We usually ship at the beginning of the month depending on the weather. Please note that we sometimes have to skip some winter months or the hottest summer months and add them to the end of your membership. We always watch for a safe week to ship.